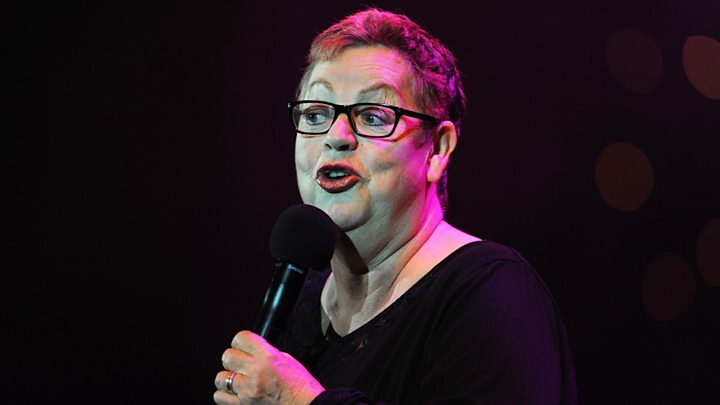 Jo Brand is a woman with staying power – she’s been on our radar for the best part of three decades and the media have cast her as everything from man-hater to national treasure during that time. She’s no man-hater, of course. And she’d prefer to “maintain a decent taint of national disgrace” than be a national treasure. The comedian recently hit the headlines when she rebuked Have I Got News For You panellist Ian Hislop for not taking sexual harassment seriously enough. We asked Brand about that moment, the #MeToo backlash, Strictly Come Dancing – and if it’s OK to ogle men in wet shirts. 1. She wasn’t expecting the reaction to her takedown of Ian Hislop on HIGNFY. “I was surprised [by the reaction]. I get on really well with Ian but I really disagreed when he went: “Some of this is not high level crime, is it? [in response to some headline examples regarding allegations about MPs’ behaviour]. Brand’s latest book is titled Born Lippy: How to Do Female. She covers a variety of topics ranging from keeping safe on a night out, how to make friends, handling road rage and how to stay being a feminist. Despite this, Brand describes herself as “a reluctant adviser”. She says: “I don’t really like advice books, so how come I’ve ended up in this situation where I’m giving advice? There’s very much a caveat with mine – please ignore it, in fact, I’d prefer it if you did! Brand reveals that when she walks home alone after a night out, she keeps her house key in her hand, pointed outwards, just in case she is attacked. 6. Men – don’t steal our jokes! Brand was making jokes about periods long before it became ok to talk about menstruation in public – indeed, if it is OK, even now. “Personally, I never do that ogling thing, I just find it uncomfortable when men do it to women and when women do it to men. When men go to see strippers, there’s an unpleasant, lascivious, blank-eyed stare that they do. “Women go and have a laugh because they’re pushing those boundaries, whereas I think for men it has a very different quality to it, it’s unsettling. If women want to ogle men, go ahead but it’s not my thing. “I don’t really [like cakes],” the host of Great British Bake Off’s Extra Slice and former host of Jo Brand Through the Cakehole confesses. “I think it just eats your soul. I’ve been asked to do it quite a few times, I asked Colin Jackson what it’s like. He said the problem is that one or two people take it really seriously and then everyone feels like they have to. So you’re not doing your expected five hours a day, there’s people getting there at 5am and working til 7 or 8 at night. “And I would just worry that I’d be forced into having an affair with one of the male dancers. They’re not really my cup of tea!